Quality function deployment (QFD) is a method developed in Japan beginning in 1966 to help transform the voice of the customer into engineering characteristics for a product. Yoji Akao, the original developer, described QFD as a "method to transform qualitative user demands into quantitative parameters, to deploy the functions forming quality, and to deploy methods for achieving the design quality into subsystems and component parts, and ultimately to specific elements of the manufacturing process." The author combined his work in quality assurance and quality control points with function deployment used in value engineering. The house of quality, a part of QFD, is the basic design tool of quality function deployment. It identifies and classifies customer desires (What's), identifies the importance of those desires, identifies engineering characteristics which may be relevant to those desires (How's), correlates the two, allows for verification of those correlations, and then assigns objectives and priorities for the system requirements. This process can be applied at any system composition level (e.g. system, subsystem, or component) in the design of a product, and can allow for assessment of different abstractions of a system. It is intensely progressed through a number of hierarchical levels of What’s and How’s and analyse each stage of product growth (service enhancement), and production (service delivery). The house of quality appeared in 1972 in the design of an oil tanker by Mitsubishi Heavy Industries. The output of the house of quality is generally a matrix with customer desires on one dimension and correlated nonfunctional requirements on the other dimension. The cells of matrix table are filled with the weights assigned to the stakeholder characteristics where those characteristics are affected by the system parameters across the top of the matrix. At the bottom of the matrix, the column is summed, which allows for the system characteristics to be weighted according to the stakeholder characteristics. System parameters not correlated to stakeholder characteristics may be unnecessary to the system design and are identified by empty matrix columns, while stakeholder characteristics (identified by empty rows) not correlated to system parameters indicate "characteristics not addressed by the design parameters". System parameters and stakeholder characteristics with weak correlations potentially indicate missing information, while matrices with "too many correlations" indicate that the stakeholder needs may need to be refined. QFD is applied in a wide variety of applications viz product design , manufacturing, production, engineering, research and development (R&D), information technology (IT), support, testing, regulatory, and other phases in hardware, software, service, and system organizations. organization functions necessary to assure customer satisfaction, including business planning, packaging and logistics, procurement, marketing, sales & service. QFD is also deployed in quality improvement, quality management, military needs and consumer products. Customer services Applications for Education improvement  and services in hotels etc. The concepts of fuzzy logic have been applied to QFD ("Fuzzy QFD" or "FQFD"). A review of 59 papers in 2013 by Abdolshah and Moradi found a number of conclusions: most FQFD "studies were focused on quantitative methods" to construct a house of quality matrix based on customer requirements, where the most-employed techniques were based on multiple-criteria decision analysis methods. They noted that there are factors other than the house of quality relevant to product development, and called metaheuristic methods "a promising approach for solving complicated problems of FQFD." The process of quality function deployment (QFD) is described in ISO 16355-1:2015. Pugh concept selection can be used in coordination with QFD to select a promising product or service configuration from among listed alternatives. Modular function deployment uses QFD to establish customer requirements and to identify important design requirements with a special emphasis on modularity. There are three main differences to QFD as applied in modular function deployment compared to house of quality: The benchmarking data is mostly gone; the checkboxes and crosses have been replaced with circles, and the triangular "roof" is missing. ^ a b Akao, Yoji (1994). "Development History of Quality Function Deployment". The Customer Driven Approach to Quality Planning and Deployment. Minato, Tokyo: Asian Productivity Organization. ISBN 92-833-1121-3. ^ a b c d Larson et al. (2009). p. 117. ^ "Frequently Asked Questions about QFD". QFDI.org. QFD Institute. Archived from the original on December 13, 2013. ^ a b Hauser, John R.; Clausing, Don. "The House of Quality". Harvard Business Review. No. May 1988. Archived from the original on April 16, 2016. ^ a b Chahal, Amrinder Singh; et al. (2011). "Managing Class Room Quality Better: A Journey Thru QFD". Quality World (January): 4–11. SSRN 1829993. ^ a b c d e Larson et al. (2009). p. 119. ^ "Quality Function Deployment (Draft)" (PDF). di.ufpe.br. Archived (PDF) from the original on March 3, 2016. ^ a b c Abdolshah, Mohammad; Moradi, Mohsen (2013). "Fuzzy Quality Function Deployment: An Analytical Literature Review". Journal of Industrial Engineering. doi:10.1155/2013/682532. ^ 14:00-17:00. "ISO 16355-1:2015". ISO. Retrieved 16 April 2019. ^ a b Börjesson, Fredrik; Jiran, Scott. "The Generation of Modular Product Architecture Deploys a Pragmatic Version of Quality Function Deployment". Archived from the original on December 31, 2012. Larson, Wiley J.; Kirkpatrick, Doug; Sellers, Jerry Jon; Thomas, L. Dale; Verma, Dinesh, eds. (2009). Applied Space Systems Engineering. Space Technology. United States of America: McGraw-Hill. ISBN 978-0-07-340886-6. Hauser, John R. (April 15, 1993). "How Puritan-Bennet used the house of quality". Sloan Management Review (Spring 1993): 61–70. Archived from the original on September 10, 2015. Tapke, Jennifer; Muller, Alyson; Johnson, Greg; Siec, Josh. 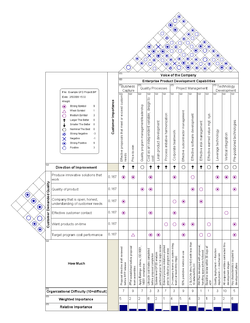 "House of Quality: Steps in Understanding the House of Quality" (PDF). IE 361. Iowa State University. Archived (PDF) from the original on November 5, 2003. "General principles and perspectives of Quality Function Deployment (QFD)". ISO.org. International Organization for Standardization. December 2015.